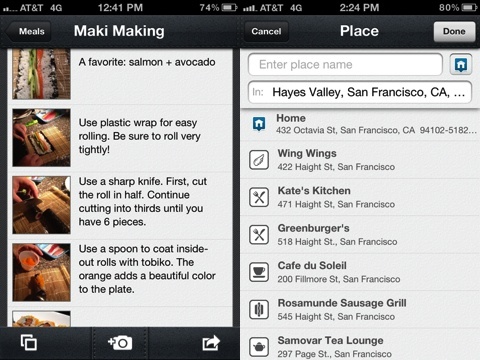 Foodie plus the Evernote Food app for iPhone and iPod Touch equals love. Unlike many food and restaurant iOS apps, you can track your food victories and defeats without the incessant need to join a foodie social network. You can take photos and add your unique tags and notes in a simple, clean, and striking interface, then you can choose whether or not to share your Evernote Food iPhone app insights. To get started with Evernote Food’s iPhone app, you sign in through your existing Evernote account to sync across your devices and access relevant notes from existing Evernote notebooks, or you can create an account for those new to Evernote. You are introduced to Evernote tools and features with gorgeous, visually stunning photos and concise, clear directions. The tutorial ends with a suggestion to add your first menu. You can take a photo from within the app, or you can add photos from your iPhone camera library. You can add multiple photos to one menu by simply tapping all of them. If you hold your finger on a thumbnail, you can move and scale a photo to clean it up before you upload it. After you choose photos, you add captions, location, tags, and notes. The Evernote Food iPhone app has smooth, seamless, and intuitive interface to move through each action. You can post your menu to Facebook, send to Twitter, or email the menu. Your menus are organized in a simple, yet beautiful list format. The middle third of your photo adds dimension to an otherwise bland listing of the title, upload date, and location for menus with one photo. When you have included multiple photos, there is a lovely trio of thumbnail versions to add visual interest. The Evernote Food iPhone app is an excellent tool to catalog your favorite meals and experiences at a restaurant–or epic fails, but its agile interface truly shines for the home cook. You can take photos of your ingredients, a recipe, and each step. You can quickly add notes, so you can remember what step didn’t work or a substitution. The customized tags can help you shop for ingredients with greater efficiency for a specific dish and help you remember preferred items. You type a keyword in the search bar at the top of the menu list to filter your menus. Foodies tend to be a particular group, and that is true at my house. My husband is extremely particular about the snacks he packs for his daily commute, so I take a photo of his likes and dislikes and tag them appropriately. I no longer encounter my husband’s sad face, when I buy the wrong thing. The Evernote Food iPhone app crashes, so hopefully that item will be addressed. The crash is definitely mitigated by the request to submit the crash to the Evernote Food iPhone app developers. When you open it after a crash, there is a pop-up menu that allows you to send an anonymous note. This simple tool should be part of every iOS app. If users could report a problem to someone who can fix it, they may not feel like voicing their displeasure to their 667 Facebook friends and 432 Twitter followers. 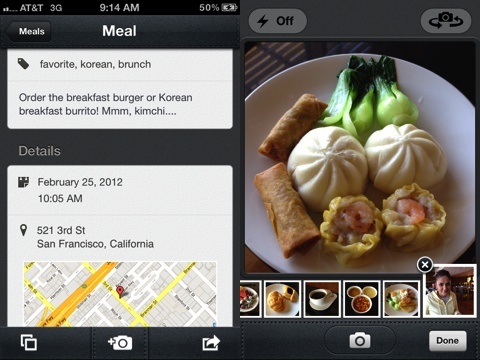 Despite the crashing, there are so many great features that make the Evernote Food iPhone app appealing. The amazing free price tag for smart functionality is yet another bonus. The Evernote Food iOS app has the functionality to become your cookbook, shopping list, and resource for a great night out. AppSafari review of Evernote Food was written by Jenni Ward on July 20th, 2012 and categorized under App Store, Food, Free. Page viewed 3677 times, 2 so far today. Need help on using these apps? Please read the Help Page.